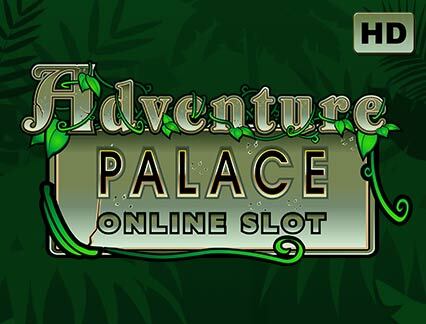 Adventure Palace - Enjoy This Online Slot Game For Free! Game Information: Let’s get ready to rumble in the jungle with Adventure Palace, a five reel, nine payline pokie machine powered by Microgaming. Featuring an exotic animal and jungle theme, players can expect many thrills and spills on the reels as you go about your adventure in search of riches and rewards. With only nine paylines, Adventure Palace is a great option for players looking for a fuss-free experience that is not too advanced or complex. That being said, seasoned players will also enjoy the many free spins available as well as multipliers, so there is plenty happening in terms of excitement and pokie action. 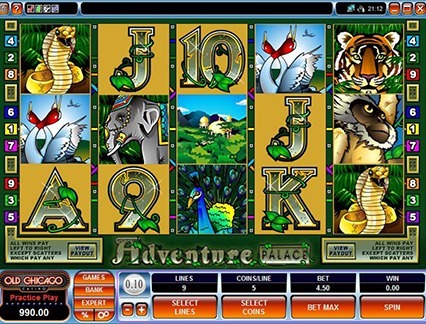 Adventure Palace is a popular five reel, nine payline online pokie that features various theme-appropriate symbols that includes wild animals like tigers and cobras, as well as the Elephant wild and the Landscape scatter. Players can play for free or for real cash via your desktop or mobile device. At the start of the game, you must adjust your bet with the coin value ranging from 0.01 to 2.00. Choose ‘select lines’ to change the number of active payline, while ‘select coins’ chooses the number of coins to bet. Once you are ready to play, press ‘Spin’ and the reels will be set in motion. Symbols to look out for include the wild and scatter symbols. Elephant Wild – Land a winning combination that features a wild symbol and receive a 2x multiplier as well as be treated to an animation of the elephant trumpeting and blinking its eyes. Free Spins –The free spins feature is triggered when you land three, four or five scatter symbols anywhere on the reels during the base game. Here you will be rewarded with 15 free spins and any prizes you win through creating winning combinations will enjoy a 3x multiplier. Adventure Palace features bright and bold colours and graphics and a vibrant sound track to get everyone in an excitable mood. The visual effects are striking to say the least in typical Microgaming fashion, affording players with an entertaining experience on the reels. While Adventure Palace does not offer a progressive jackpot, the game does feature a decent jackpot prize of 10 000 coins, which is obtainable if you bet the maximum. The game features a great gamble feature that allows players to double or even quadruple your bet. Guess the correct colour of the face down card and double your bet, or guess the correct suit and quadruple your bet. However, on the downside, if you guess incorrectly, you will lose everything and the feature ends. To end the gamble round, simply click ‘Collect’ and you will continue to normal gameplay.